Earth Veins Ep 10: The Magic of Skook. 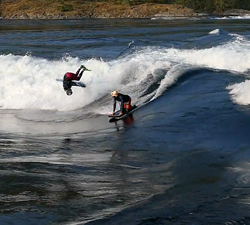 The paterson brothers shed some light on what the Skookumchuck wave is like and the beauty around it. Located in a the tiny town of Egmont, BC. Tourists come to hike through the beautiful forest and watch this wave and the riders on it. The Paterson Brothers made a point of spending as much time here as they could while visiting British Columbia in July/August 2018.